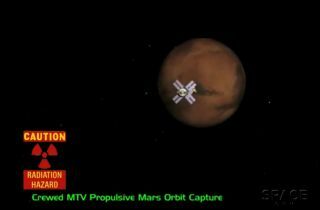 This still frame from a video illustrates the danger of overexposure to radiation for astronauts on a mission to Mars. NASA should set up a clear set of ethical rules regarding the health of astronauts on long-duration spaceflights — such as a trip to Mars — in the near future, according to a panel of health and ethics experts. As it stands now, astronauts on a roundtrip mission to Mars would experience a level of radiation exposure that violate at least one of NASA's existing health limits, according to previous Mars mission studies. Such a trip to the Red Planet would expose astronauts to enough radiation to increase their lifetime risk of developing fatal cancer by more than 3 percent, a health limitation imposed by NASA. Those exceptions could be vital for missions that send humans to Mars, an ultimate goal for NASA, or to send astronauts on ultra-long missions to the International Space Station. Currently, astronauts spend about six months on the space station. A NASA astronaut and Russian cosmonaut are due to fly a one-year trip to the station in 2015. "From its inception, space exploration has pushed the boundaries [of human endurance] and risked the lives and health of astronauts," Jeffrey Kahn, chair of the IOM committee, said in a statement. "Determining where those boundaries lie and when to push the limits is complex. NASA will continue to face decisions as technologies improve, and longer and farther spaceflights become feasible. Our report builds upon NASA's work and compiles the ethics principles and decision-making framework that should be an integral part of discussions and decisions regarding health standards for long-duration and exploration spaceflight." Some of the risks astronauts face during long-term spaceflights include vision impairment, heightened cancer risk due to radiation exposure and bone loss from the microgravity environment, the report said. There may also be risks that are "unforeseeable" before the mission begins, the report added. The first step in this ethical framework should be deciding if a long-term space mission's value is worth the potential risk to the astronauts performing it. If a mission is considered "ethically acceptable," then NASA officials should develop a system for granting the exception. The IOM report does not comment on the value of specific missions. According to results from NASA's Mars rover Curiosity, a 180-day flight to the Red Planet followed by a 600-day stay on Mars and a 180-day flight back to Earth would expose astronauts to about 1.01 sieverts (radiation units). Some researchers consider that level of radiation manageable, however, it would violate NASA's current standard that caps the excess cancer risk for a given astronaut at 3 percent. Recognize fidelity and the individual sacrifices made for the benefit of society, as well as honor societal obligations in return, by offering health care and protection for astronauts during missions and over the course of their lifetimes. "Astronauts put their lives and health at great risk for their country and humankind," Kahn said. "Our report builds on NASA’s work and confirms the ethical imperative to protect astronauts' health, while fulfilling the agency's mission of exploration." NASA should also inform astronauts of the known risks of a long-duration mission every step of the way — before launch, during the mission and after the astronauts return to Earth, IOM officials said in the report.